Masada (Hebrew "fortress") is a flat plateau measuring roughly 1,000 by 2,000 feet, situated atop an isolated rock cliff at the western end of the Judean Desert. At the eastern end, the rock falls in a sheer drop of nearly 1,500 feet to the Dead Sea (the lowest point on earth, some 1,300 feet -- 400 meters -- below sea level) and, on the western side, it stands about 300 feet above the surrounding terrain. It is traditional to climb Masada in the early morning, before the desert gets too hot, to watch the sunrise over the Dead Sea from the fortress. You can either hike up the snake path (about a 45-minute walk) or take a short cable car ride to the summit. Either way, you will enjoy one of the world’s most spectacular sights and experience the dawning of a new day like you have never seen before. The only written source about Masada is Josephus Flavius’ book, The Jewish War. He wrote that Herod the Great built the fortress of Masada between 37 and 31 BCE as a refuge. The water supply came from a network of large, rock-hewn cisterns on the northwestern side of the hill. They filled during the winter with rainwater flowing in streams from the mountain on this side. Cisterns on the summit supplied the immediate needs of the residents of Masada and could be relied upon in time of siege. On the northern edge of the steep cliff, with a splendid view, stood the elegant, intimate, private palace-villa of the king. It was separated from the fortress by a wall, affording total privacy and security. 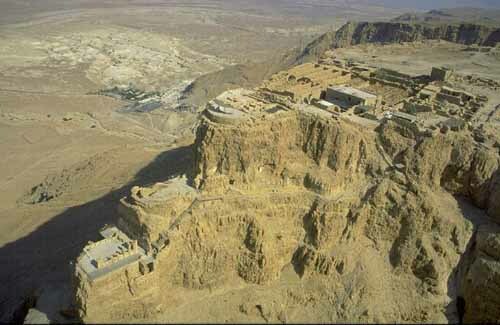 Along the western casemate wall, Herod built a palace, the largest building on Masada, covering approximately one acre. At the beginning of the Great Revolt of the Jews against the Romans in 66 CE, 75 years after Herod’s death, a group of Jewish rebels overcame the Roman garrison of Masada. After the fall of Jerusalem, and the destruction of the Second Temple (70 CE), they were joined by zealots and their families who had fled from Jerusalem. This small band of 960 Jews held out against the mightiest army in the world for three years. The Romans, however, were not about to let even this handful of rebels, which had played a key role in starting the revolt, get the best of them. In 73 CE, the Roman governor Flavius Silva marched against Masada with the Tenth Legion and 10,000 Jewish slaves. With the strategic advantage of the high ground, the defenders could easily target their attackers, but the Romans were persistent. They constructed a rampart of thousands of tons of stones and beaten earth against the western approaches of the fortress and, in 74 CE, moved a battering ram up the ramp and breached the wall of the fortress. Once it became apparent that the Tenth Legion's battering rams and catapults would soon succeed in breaching Masada’s’s walls, Elazar ben Yair, the Zealots’ leader, decided that all the Jewish defenders — men, women and children — should burn the fortress and commit suicide. According to Josephus, two women and five children managed to hide themselves during the mass suicide, and it was from one of these women that he heard an account of Elazar ben Yair's final speech in which he said the Zealot’s "preferred death before slavery." During the excavations, Yadin found 25 skeletons of men, women, and children. In 1969, they were buried at Masada with full military honors. The heroic story of Masada and its dramatic end attracted many explorers to the Judean desert in attempts to locate the remains of the fortress. The site was identified in 1842, but intensive excavations took place only in 1963-65 under the leadership of Yigael Yadin. The Israeli army and thousands of volunteers from 128 countries assisted in the project. The archaeologists found Herod’s residential and western palaces, a storehouse complex, bathhouse, two mikvaot (ritual baths), artifacts such as coins and pots and a synagogue (the oldest in Israel) used by Masada’s defenders. For many years, new members of the Israeli Defense Forces would be sworn in at Masada and promise that Masada would not fall again. The practice was abandoned in 1986, Rabbi Lawrence Hoffman says, because "its underlying message of heroes who commit suicide no longer captured the imagination of a Jewish state which emphasized life, not death, and victory rather than defeat." Nevertheless, Masada remains the symbol of the determination of a people to be free in its own land.